Recent natural disasters in Japan have led to redoubled interest in earthquake-resistant buildings. These homes are built to tolerate tremors, resist collapse and most importantly, protect the lives of the inhabitants. This is a growing field that has made great advances in recent years. The home we will explore today is one such home. It was built in the southern Japanese city of Hamamatsu. The city lies in the Tohoku region, an area prone to particularly ferocious earthquake due to its location on the boundary of four tectonic plates. The designers Kuboesen Architects responded to the challenge like true creatives. They didn't see the limitations, they saw the possibilities. The end result is a home with a very private ambience and a superior base structure. Come with us to explore its features. Enjoy! The home was built as two small masses to minimise the potential damage caused by shifting ground. These two masses are arranged around two inner courtyards. 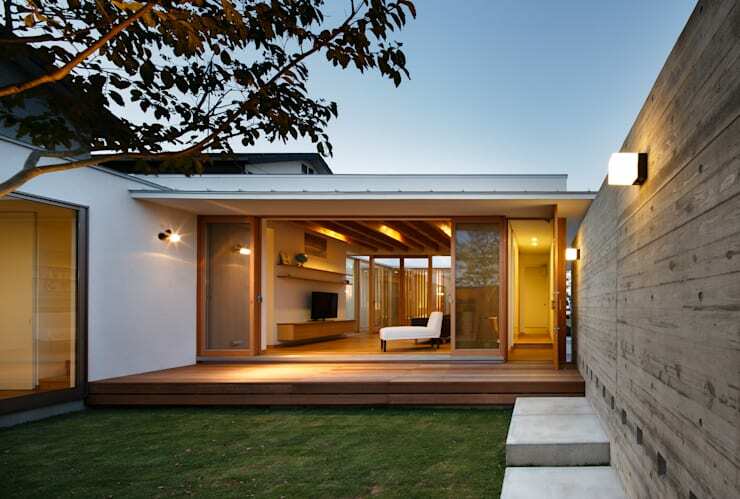 The courtyard we see here has a grassy green area, golden timber deck and a strong, raw concrete supporting wall. A truly stunning glimpse of geotechnical ingenuity combined with sleek, traditional Japanese design. The home faces a fairly narrow road and the owners were conscious of their privacy. So the exterior has been set six metres back from the street and has no outward-facing windows. The home covers 160 square metres, but it has been spread out and built as a single-level construction with a flat roof. There is plenty of outdoor parking space. The home is very private and enclosed, but the interiors have a spacious, natural ambience. This is due to the copious amounts of exposed wood used on the floor and ceiling. The large opening that leads to the courtyard has been designed to create a very easy sense of flow between the two spaces. 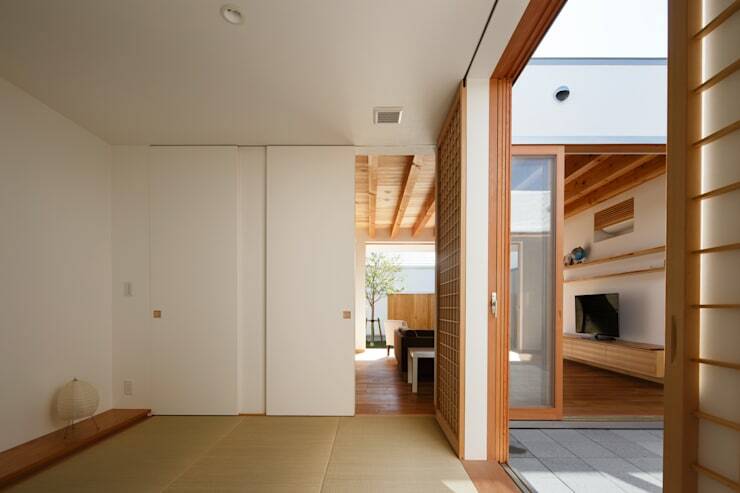 In the foreground of this photo we can see Japanese shoji sliding doors and a tatami floor. 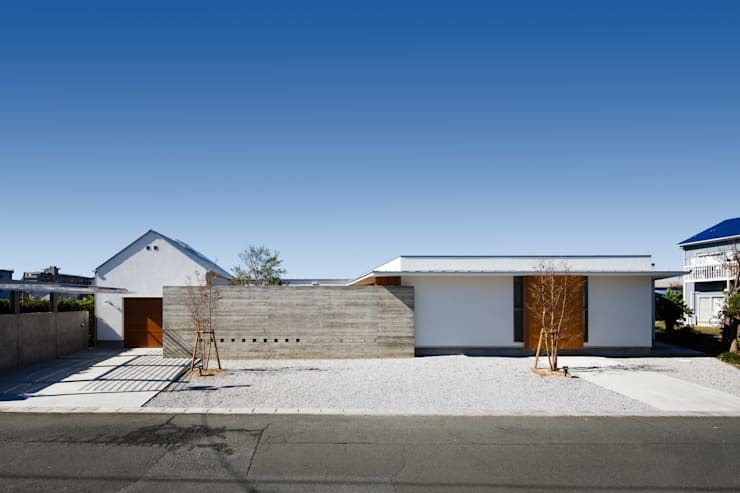 This may be a contemporary Japanese home, but it's also one with traditional features modified to suit the contemporary decor. 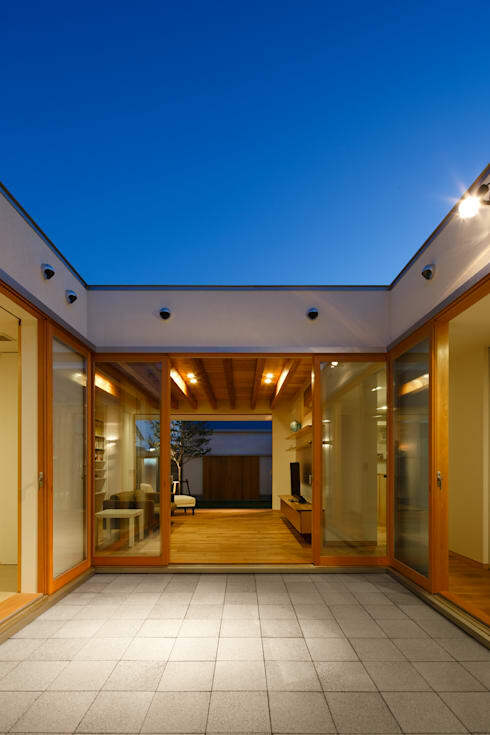 Every room within the house has glass sliding doors and access to one of the two courtyards. Here in the second courtyard, we also get a sense of the strong connection with nature inside these spaces. There is no overhead shade and the occupants have an unimpeded view of the clear night sky. The home might be enclosed, but it has an open, sociable feel. 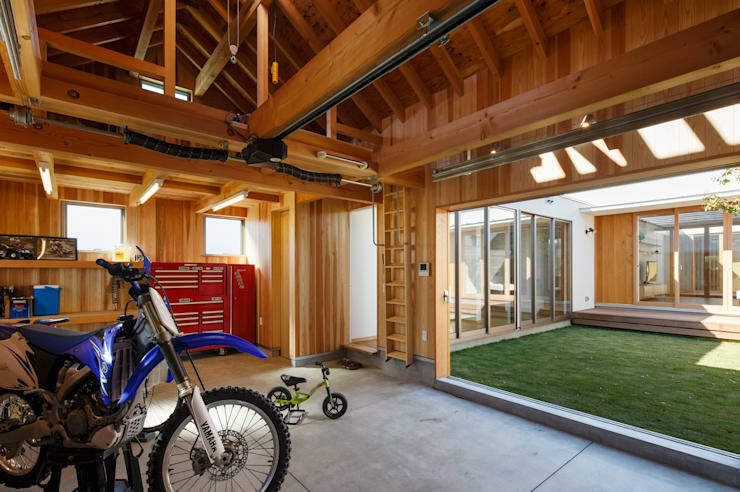 Although there is plenty of parking space outside, the home possesses an internal wooden garage or shed. As is common in Japanese homes, this is a multi-functional space that can be adapted according to the needs of the occupants. 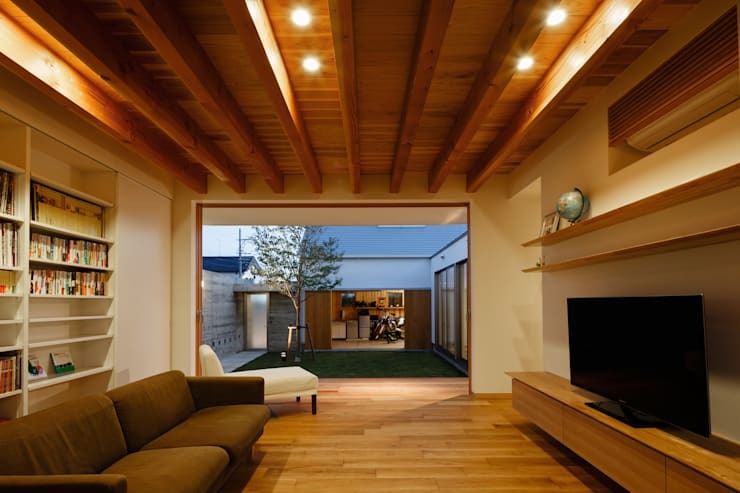 There is a raw, unfinished quality about this space with its exposed timber beams and concrete floor. This reflects traditional Japanese reverence for imperfection and the aesthetics of authenticity. Hungry for more timber homes? Then you'll love The wooden home of perfect colours. What do you think of the clever way this house is built? Can you imagine living here? We'd love to hear in the comments field below!